Beautiful brunette actress Lauren Graham was recently on Ellen to promote her appearance in a new movie – Flash Of Genius – with actor Greg Kinnear. Ellen introduced Lauren by saying she (Lauren) is one of “our absolute favorites”. Ellen played a clip from Lauren’s latest movie which is called Flash Of Genius. In the clip Lauren was wearing a wide bandeau headband holding her thick and lush straight hair back from her face. The stick straight hairdo was a great hairstyle for her. When she appeared on stage Lauren looked gorgeous with her glossy dark brunette tresses styled into a cascade of loose waves ending in very soft curls. Her waves cascaded from an off center part spilling onto a saucy retro style print dress. As always Lauren was her bubbly and incredibly funny self. Ellen welcomed Lauren by saying “please welcome my friend Lauren Graham”. The talk show hostess started by saying she had not seen the actress since way after her birthday party. Ellen explained the party was way too crowded for Ellen to hang out with Lauren. Lauren agreed she had been to the birthday party but also had attended Ellen and Portia’s recent wedding. 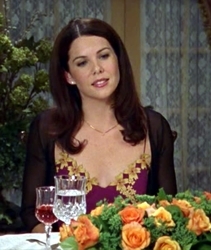 The former star of The Gilmore Girls said Ellen’s birthday was like a “Disneyland Birthday Party with ice sculptures.” Although the actress reported she had “such a good time” she claimed to have had a “panic (attack) at the party because people kept coming from different corners” saying things like “they’re giving out gold in the corner”. Lauren said it “was insane” and “there were bumper cars, life size portraits being drawn, gambling, free money”. Ellen laughed and told Lauren it was really “fake money”. 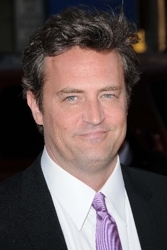 Besides trying to deal with the “truly unbelievable” and “really fun” party Lauren admitted she was slightly freaked out because she attended the birthday party with her “friend” Matthew Perry. Because Ellen is always teasing her and making fun of her friendship with Matthew Perry, Lauren was worried when she saw the cameras that were snapping guests as they entered the party and later saw cameras following her through the party. Lauren told Ellen she literally “started walking away (from Matthew) because she was so afraid of Ellen seeing the tape and playing it on the show”. Or doing something else to give Lauren a hard time about Matthew. Lauren’s attempts to avoid being filmed with Matthew really did no good since Ellen saw the tapes anyway and of course brought it up on the show. Lauren scrambled her words when discussing how Ellen teases her. It was hilarious. The actress said “I have much been made much fun of here”. You always made fun of me for not going out with him. Ellen teased Lauren about scrambling her words and asked her “have you made out with him ever at all”? Lauren got past Ellen’s ribbing about Matthew without talking about any hot makeout sessions. The actress noted she “met Tom Hanks” at the party. Ellen said, Tom “was dancing like crazy”. Lauren said she also “met a lot of American Idols”. Ellen said a lot of past and present Idols were there. Lauren said she “met the Idol guy with the accent – you forget, there are so many”. Ellen told Lauren the American Idol guy with the accent was Michael Johns. Lauren said she “met all the foreign Idols and the Irish girl”. Ellen then noted that Lauren looked “great” and “very healthy”. The actress replied “I’m doing a thing that is awful where you drink a bunch of juice and that’s about it and all the toxins leave your body”. She told Ellen she was on Day Five of the juice plan. “Can you tell”? she asked Ellen. Lauren was extremely funny as she explained to Ellen the importance of getting “the toxins out of the body”. She said all of “the juice” she drinks basically “tastes the same” but she’s having whatever they tell her to have because it’s all “very good for you”. She told Ellen the people at the juice place are “all happy and crazy and don’t have toxin eye.” Lauren said that the people at the juice place “do group yoga and one day they cancelled the class because everyone was feeling so tired” but she was feeling fine because “she was eating” and “she had coffee in the car”. Which was beyond hilarious. Lauren also admitted that since she started doing the juice thing “she feels crazy” but Ellen said the actress “seemed the same as always” meaning normally crazy. Lauren said “they call it a fast and I call it suggestions”. She said maybe she “was feeling crazy – right? I can’t even speak – because of the raw food”. Then she told Ellen. “Oh my god I’m so needing a pizza”. Ellen then discussed the movie Lauren was recently in with Greg Kinnear called Flash of Genius. Lauren told Ellen she got the acting job “from being on Ellen” when the movie’s producer saw a segment where Lauren had her feet up and Ellen brought her a mojita in a little truck. Lauren went on to explain the film is the story of an inventor who invents the intermittent windshield wiper and takes on a large corporation. She said “it’s a beautiful movie and Greg Kinnear is amazing”. Lauren Graham is a very entertaining and whacky guest on Ellen. She always has great stories to share and her latest adventures of doing juice fasting while sneaking food, coffee and pizza was beyond hilarious. Of course Lauren’s hair always looks lush, full and very shiny. If you ever have a chance to see Lauren Graham as a guest on Ellen be sure to set your TIVO. You won’t regret it. This entry was posted on Wednesday, December 10th, 2008 at 10:33 pm	and is filed under Celebrity Bites, Celebrity Hairstyles, Celebrity News, Celebrity News & Juice, Ellen Degeneres, Hair, Hair Styling Tools, Hairstyles. You can follow any responses to this entry through the RSS 2.0 feed. Both comments and pings are currently closed.